Another day, another family-focused Citroen vehicle. This time it's a variation on the Berlingo Multispace theme, one with two extra seats in the back. Bringing the tally to seven, this Berlingo offers owners wither a larger than average family the option of an affordable alternative to a potentially more costly people carrier. French car maker Citroen is famous for many things. Cashback deals and heavy discounting in the showroom might spring to mind. The firm has also built up a reputation for offering practical, versatile and attractive multi-purpose vehicles. 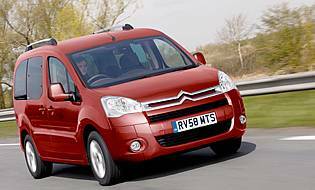 The previous Berlingo model was a huge success for Citroen, and this model is destined to emulate the old car's behaviour. What's clear from a brief visual inspection is that this Berlingo is now a little bigger and more sophiticated-looking. With its wider stance and more rounded appearance, it gives oozes refinement - something the old car never quite managed to achieve. Despite the posh exterior, this Berlingo is no less versatile inside. It might look more C4 than utility van, but an active family will have no trouble getting it dirty. This is no prime and proper MPV in the conventional sense. Storage space is generous, the cabin feels light and airy and the car's tailgate is big enough to use as a shelter if it rains. What sets it apart form some similarly priced rivals is the extra two seats - making it a practical seven-seater. 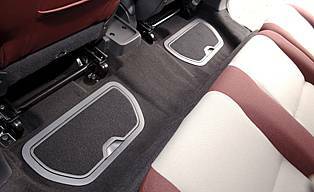 Opt for the 'Family Pack' option on VTR-spec cars and you gain two extra rear seats. Like the middle row, these can fold and be removed to boost carrying capacity. Children and small adults will fit fine, ensuring the rearmost seats are not decorative features. Rounded and more refined than previously, this Berlingo Multispace retains all that was good about the old car and adds some welcome extra polish. Predictably diesel variants shine, although petrol models are hardly outlclassed. The Family Pack including the rearmost pair of seats adds an extra versatile angle to an already impressive family holdall. In seven-seat form the Berlingo has an advantage of similarly sized five-seat rivals. A six-footer would find it uncomfortable in the back, but the facility is really meant for shorter adults and mainly children. All five rear seats can be seperately folded and removed for more space, while up front oddment storage is good considering the car's practical leanings. Familiar and easy to use controls are the order of the day. The main dials are clear and easy to read day or night, while the column stalks are intuitive to operate. Gearchange, brakes and steering require little effort. 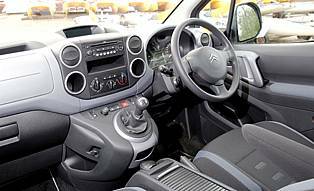 Well known for its soft, supportive seats, with the Berlingo Citroen has succeeded again where many rivals have failed. 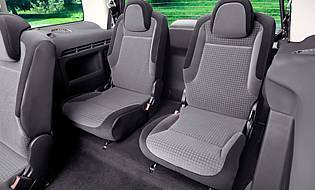 There's also a refined cabin ambience when on the move, which is good considering the Berlingo platform's dual role as a van. Wind noise is noticable at speed but the car is more upright than a regular family hatch. Don't expect an all-singing, all-dancing alarm system with the Berlingo. The usual remote locking and immobiliser should be good enough. With all the seven seats in place there isn't much scope for storing items out of sight. A luggage cover is available, though. For a car in this price point there's little if anything to complain about. All the bases are covered here: anti-lock brakes and airbags. Interestingly for a car in this class you do get lateral side aibags, a welcome addition. As tested in HDI 90 diesel form, the Berlingo is rarely short of power, even when fully loaded. The brakes inspire confidence, as does the steering. The raised driving position and range of adjustments ensure a comfortable journey. On the soft side, the car's suspension is good at absorbing urban road imperfections, although this does mean some pronounced roll through tight corners. It's pretty obvious that the Berlingo has been designed with the family in mind. All the basics are present: practicality, flexibility, modest running costs, durable cabin materials. The third row of seats will please larger families and there's a lot ot be said for the rear slding doors - no more crashing into the adjacent parked car in a crowded supermarket car park. Despite the Berlingo's size it is an easy car to drive. Light controls and good visibility should help the novice. The lofty driving position is another plus point, although to keep costs down the smaller Nemo Multispace would be slightly better. Affordable, low-cost family motoring is a Citroen speciality, and plenty of families already know this. Fuss-free interiors and practical seating options are key attractions. Build-wise Citroens have improved considerably in recent years; better construction, choice of materials and aftersales support the main factors. With its van-like proportions the Berlingo is a little taller than a regular family hatch. This makes access and egress easy, while the raised driving position another plus point. Sliding rear side doors are a welcome bonus when parking in tight spaces, although the car's oversize tailgate will force you to park nose in when parking in car parks. The standard fit audio unit does a fine job; this is hardly a car that's likely to ebefit from a costly, premium entertainment system. The split level head unit and display layout works well, as does the remote controls on the steering column. A basic sat-nav option is available. With a modest exterior range to choose from, bright colours do much to flatter the Berlingo's size. The car's chrome grille also provides some light relief. Inside it's the usual combination of dark plastics and trim materials or the option of lighter seat fabrics - not always a wise choice if you have messy children to contend with. The lofty driving position is a bonus here, as is the car's light but accurate power steering. The van-derived mirrors are a welcome addition along with the oversize rear window. Parking sensors can be had to make life easier still. Petrol engine options - 1.4-litre (75bhp); 1.6-litre (90bhp, 110bhp). Diesel engine options - 1.6-litre (75bhp, 90bhp,110bhp). Transmission options: five-speed manual gearbox. Trim levels: First (1.4 petrol and 1.6 75bhp diesel) VT, VTR, XTR. Family Pack seven-seat option is for petrol and diesel 90bhp cars in VTR trim.